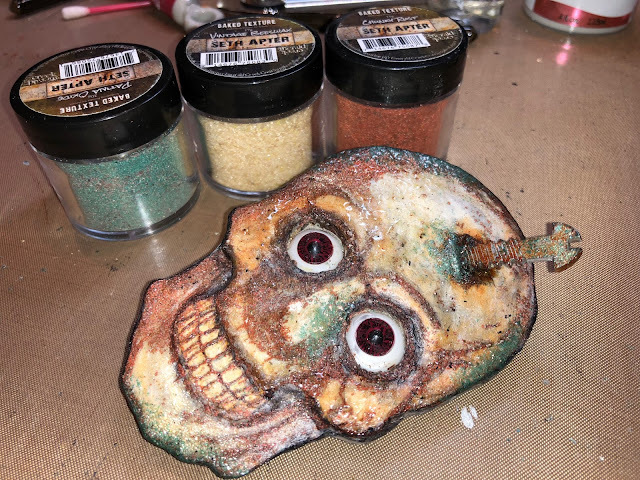 With Halloween fast approaching, I thought I'd experiment with one of Andy's really cool stamps; the skull from his Skuldoggery set and see if I couldn't make it a bit 3D. I actually LOVE the way it finished out and am excited to share the process with you! Here is the finished tag. 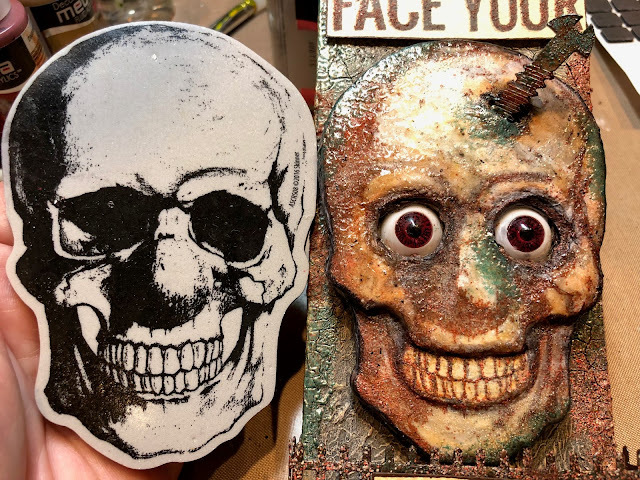 I'll share the steps used in creating both for you as it was so much fun and I don't want you to miss out on any of the techniques. First let's do the tag and then we'll concentrate on the rather wicked boney fellow! The tag is a Long Greyboard Tag from Tando Creative. It is 7 1/2" long rather than the standard 6 1/4" tag. So lots of extra space for you to work with and the greyboard is strong and sturdy and takes lots of abuse from mixed media elements. Here I started with a fairly thin but thick enough to stamp in layer of DecoArt Media Modeling Paste applied with a palette knife. 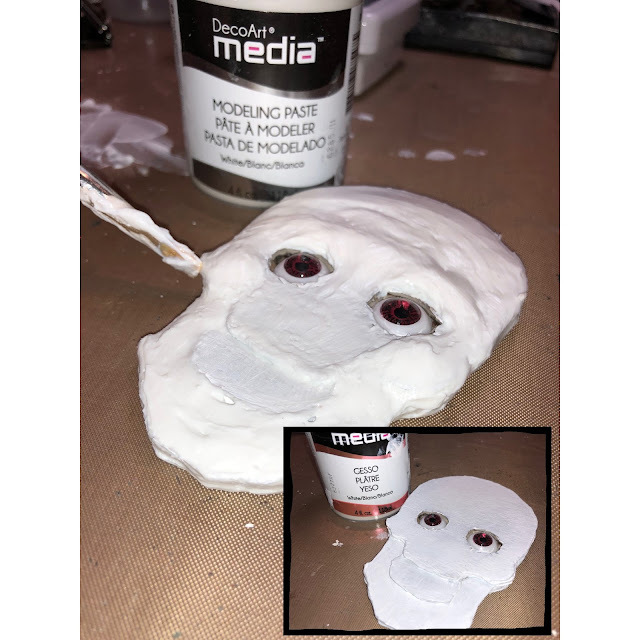 Then I gently began to heat set it; not completely but enough so that you can press the stamp into the almost dried Modeling Paste and get a wonderful imprint. I chose the stamps from Andy's wonderful Fossils stamp set to keep with the theme of "bones". I also just love those stamps! Lightly spritz the stamp with water before stamping into the Modeling Paste. Then wash the stamp immediately. Then continue to heat set the tag until dry. I also used the stamps to actually stamp Modeling Paste onto the tag. 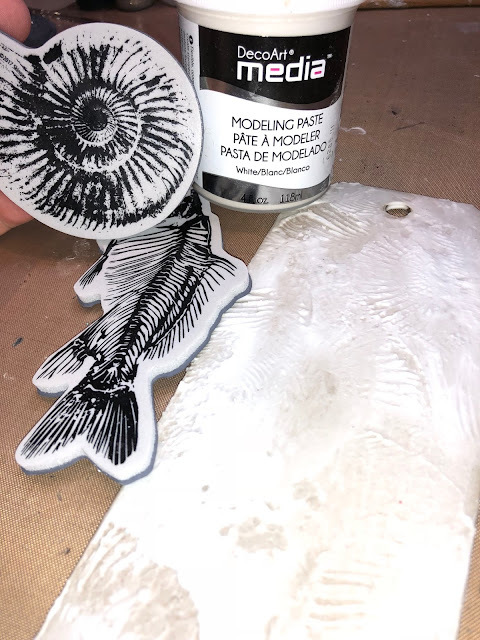 I spread some Modeling Paste onto my craft mat with my finger, pressed the stamps into it as you would an ink pad and then stamped it onto the tag. Heat set. 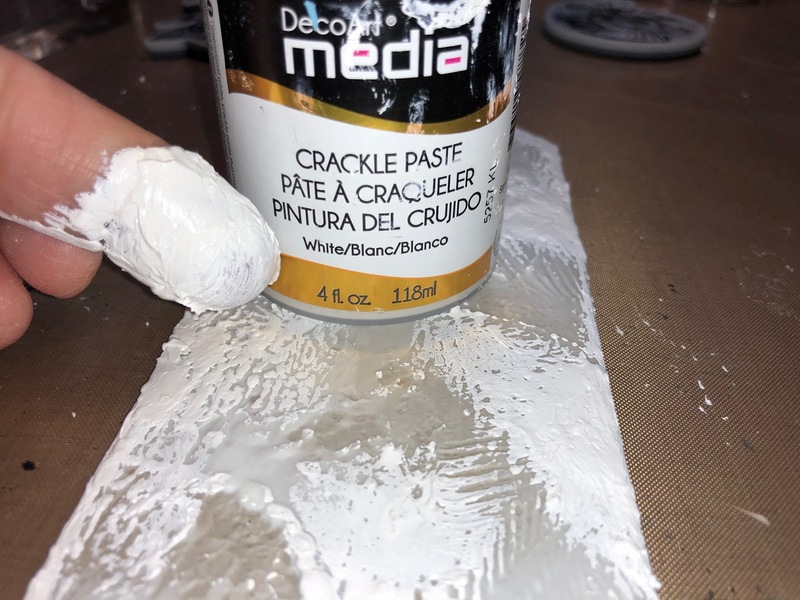 To add even more texture, I randomly added some DecoArt Media Crackle Paste onto the tag. Let this air dry as the crackling needs air drying to really work properly. To really colorize and bring out the texture patterns of the tag, I started with DecoArt Media Fluid Acrylics Carbon Black and painted over the entire tag. Then I DRY BRUSHED a layer of Titanium White. Repeat this process until you achieve the stone look and all of the highpoints to be highlighted as much as desired. 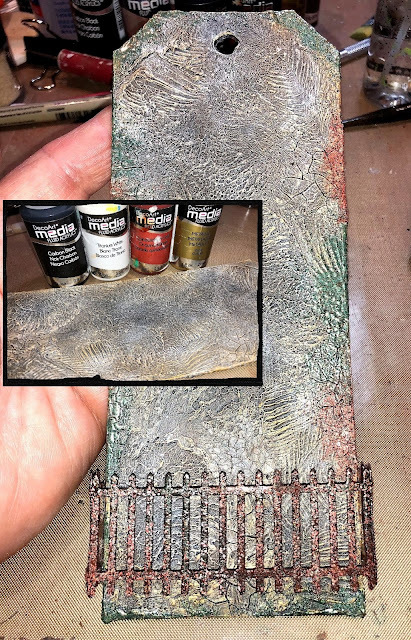 Next I added random DRY BRUSHING of Quinacridone Gold and Metallic Gold to further bring out the high areas of the tag and mimic iron or or mineral deposits in the "stone". Finally I added bits of Seth Apter's Baked Texture Embossing Powders randomly on the iron fence and tag. The colors were Patina Oxide (green shade) and Chunky Rust (orange shade). These embossing powders are exactly what Seth named them ... "baked texture". Very cool. You use these just as you would any embossing powder. Now ... onto the experimentation and the wicked skull!!! I began by stamping the skull from Andy's Skuldoggery stamp set 5 times onto chipboard. I cut out three complete skulls and glued them on top of each other. 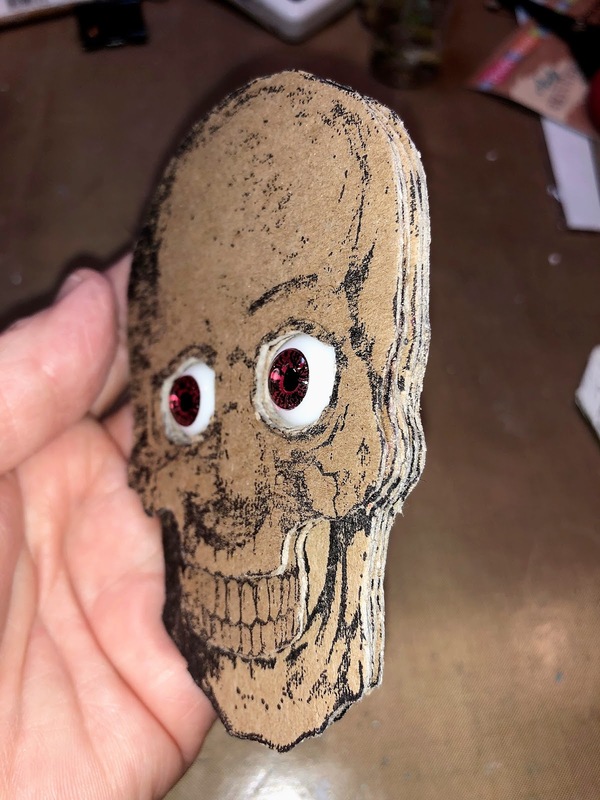 Next I cut off the lower jaw bone and cut out the eye sockets on the 4th stamped image and glued it on top of the others. Finally, I cut out the 5th stamped image right above the teeth and cut out the eye sockets and glued it into place. I found the eyes at a craft store (Michaels) in their Halloween section and glued them into place. They are wicked cool! 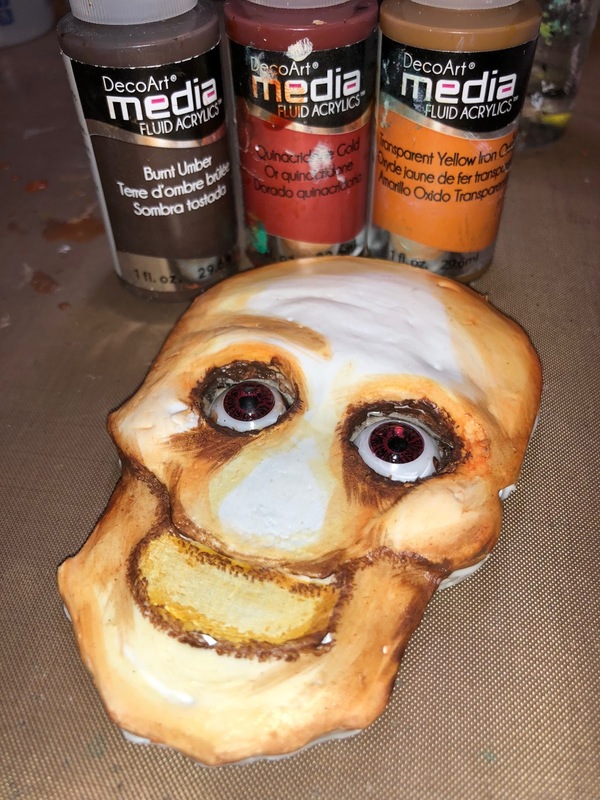 The next layer was a coat of DecoArt Media Gesso over the entire skull. Heat set dry and then begin to build a face onto the skull with DecoArt Media Modeling Paste. I used primarily a brush to do this but sometimes used my moist finger to smooth out the Modeling Paste. Let this completely dry! I heat set some of it but allowed it to dry overnight to be sure. 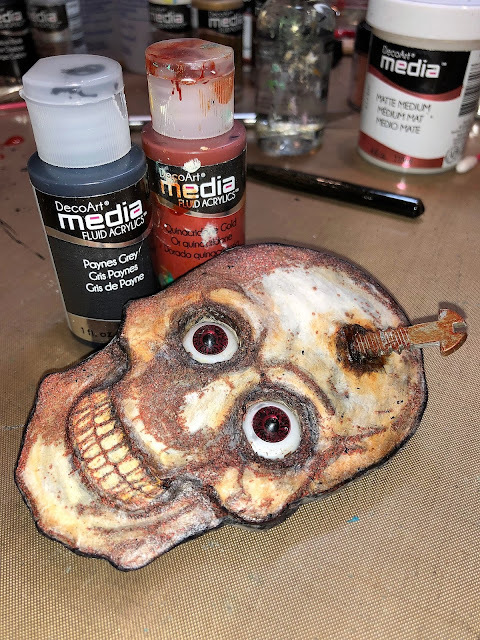 Next I tinted the skull using DecoArt's Media Fluid Acrylics. 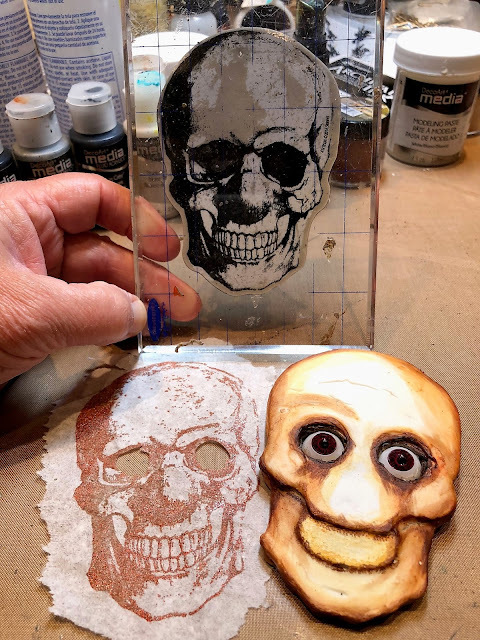 I began with Transparent Yellow Iron Oxide followed by traces of Quinacridone Gold and finally Burnt Umber for the more shadowy recessed areas of the skull. I stamped the skull image again onto a piece of plain white tissue paper using Seth Apter's Chunky Rust Baked Texture Embossing Powder. I tried Black Permanent Ink as well but I decided against that much contrast for the detail of my skull. In this picture, you can begin to see how the flat stamp of the skull is starting to come to "life". 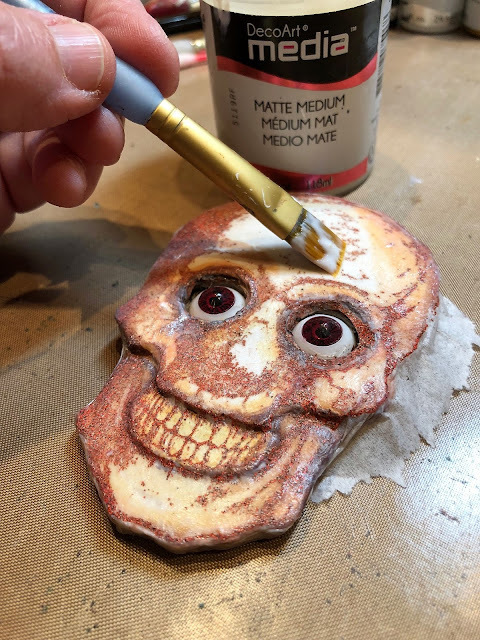 Next you lightly brush DecoArt Media Matte Medium over the skull. Carefully line the tissue stamped image of the skull onto the chipboard and Modeling Paste skull and lay it in place. Then brush Matte Medium over the entire skull, even on the sides and around the back to secure it in place. See how the tissue just melts into the skull and really brings out all of the details?? Cool! Once the tissue image was dry through heat setting, I added some more details using a small brush and DecoArt Media Fluid Acrylics Quinacridone Gold for the rusty highlights and Paynes Grey for the recessed shadowy areas. I also embedded a rusty screw from Tando Creative's Screws Greyboard set. This was simple. I first used a coat of DecoArt Metallic Silver Fluid Acrylics paint on the screw followed by several random layers of Quinadridone Gold to add that really rusty, weathered look. I slit the skull using an Exacto Knife and glued the screw in place. I surrounded the base of the screw with Paynes Grey and Quinacridone Gold to really accentuate the literal "hole in his head". For even more texture, I added random areas of the Baked Texture Embossing Powder. This time adding the Faux Beeswax on areas of the skull. 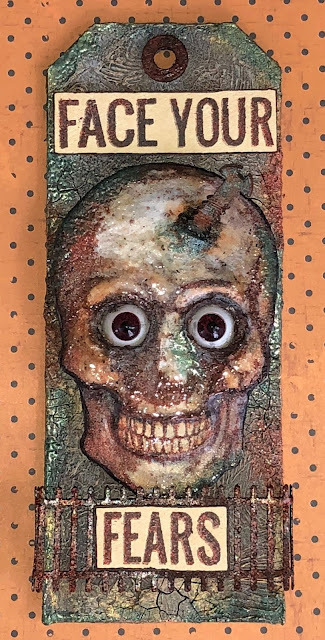 I can't tell you how tactile and fun this skull looks in person! This is a nice comparison of how the skull started out and how it finished up. Really a fun thing to do! And finally, I added the "Face Your Fears" sentiment from Andy's Unexplained stamp set. This was heat embossed on cardstock using the Chunky Rust Embossing Powder. The edges of the cardstock are lined with Carbon Black DecoArt Media Fluid Acrylics using my finger. Oh wow, you've definitely got the 3D part perfected, Candy. I love the overall effect of this splendid tag. Incredible to see how you made that skull dimensional - a brilliant piece of layering/sculpting/design. He looks fabulously creepy. Just amazing!! That tissue layer is beyond genius. I can't wait to play with that with other images. Wow and WOW again!!!! Love this scary tag, SO fabulous!!!!! Thank you Candy for this great tag and tutorial!